Appologies for the first woman crush Wednesday being posted up a day late. Sometimes there are just not enough hours in the day to get what you want done. Enough with the groveling and on with the oggling (hey i ryhmed). Behind every great man theres a great woman, #WCW or woman crush wednesday is a day in which we will revel in the opposite gender and celebrate what makes them so amazing. Remember comments can be posted below and ideas/suggestions with reasons will be appreciated. My wcw (woman crush Wednesday) is a two for one special with Marvel comics Daughters of the Dragon or as they were known proffesionally NIGHTWING RESTORATIONS. Introduced in the 1970s as a crime fighting, private investigative duo. Ex NYPD police officer who after losing an arm in a bomb attack resigned the force rather than take a desk job, tough talking, hard hitting, no nonsense, cyborg arm weilding Mercedes “Misty” Knight (who could have easily been played by the equally beautiful Pam Grier in her day) and her partner the red haired, half oriental and half caucasion, samurai sword weilding Coleen Wing. They were essentially a female version of the Heroes for Hire (Luke Cage and Iron Fist). The two teams not only occasionly worked together but Knight also had an on/off relationship with Danny Rand the Iron Fist. I had known of these characters for years but my flame of interest was not sparked for them until the 2005, 6 issue mini series was released with art by Khari Evens and written by Jimmy Palmiotti. Not much has been done with them in the past few years since the Heroes for Hire reboot was cancelled. They have had back up roles in stories such as Daredevils story arc “Shadowland,” and Knight was co-leader with Valkyrie on the Fearless Defenders team which was cancelled after 13 issuee. 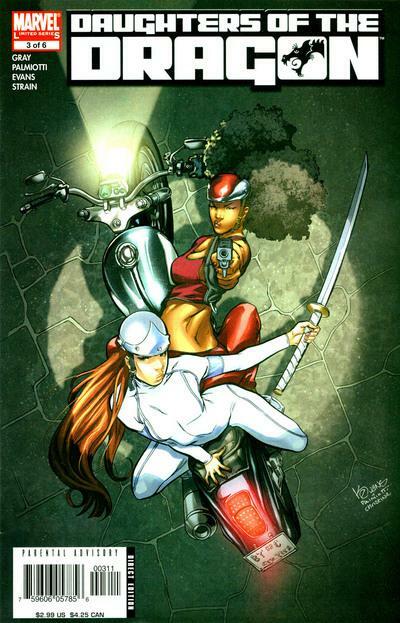 Heres hoping that someone still remembers the fun that can be had with these two trouble shooters and then thinks of a way to bring them back to the mainstream marvel universe (although with the marvel cinematic universe bringing Luke Cage and Iron Fist to the small/big screen im sure these vixens will not be far behind). Hope you enjoyed the woman crush Wednesday, just remember if you have committed a crime and these two ladies are after you, maybe just maybe it may be worth getting caught. Previous Previous post: Rain, rain go away.. I thought I was only one with a crush on The Daughters f the Dragon. No way man! We love ’em! Can’t wait to see Misty Knight on TV and hoping Colleen Wing won’t be too far behind..